Buy Go Kart Accessories Online | Trailers, Passenger Seats and more! Bling up your go kart with our extensive range of accessories. Our go kart accessories range includes spoilers, passenger seats, trailers, lifting attachments, roll bars, lights, sirens and wheelbarrows. Bling up your Berg pedal go kart with our range of accessories. 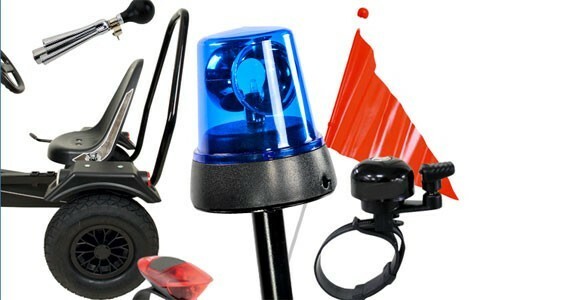 We offer a range of lights, sirens, horns, bells, mirrors, number plate kits, go kart covers, tow vars and roll bars to either further improve the safety aspects of your go kart, or just to make it even more fun! Our BERG lifting systems will provide the children with many hours of fun. Our range includes front and rear lifting attachments, pallet lifting attachments, bulldozer blades and bucket attachments. Hook up with any of the lifting attachments and then to your BERG go kart and off you go - it's that simple. Customise your BERG pedal go kart with an additional passenger seat. Add one of these BERG passenger seats and carry one of your friends around with you so that you can both enjoy the fun given from using one of these fantastic BERG go karts. Kids love to have a trailer to pull around on their go kart. These sturdy built trailers will add to the many hours of fun the children will enjoy. With these impressive go-kart trailers you can easily take an extra load with you on your go-kart adventure! Our children's wheelbarrows are very sturdy and safe wheelbarrows, incorporating a polymer body with a strong tubular steel frame. Bling up your DINO pedal go kart with our range of accessories. We offer a range of lights, horns, bells and roll bars to either further improve the safety aspects of your go kart, or just to make it even more fun! Our DINO lifting systems are made in Germany, and will provide the children with many hours of fun. Our range includes front lifting attachments, pallet lifting attachments with pallets, and bucket attachments. Hook up with any of the lifting attachments and then to your DINO go kart and off you go - it's that simple. Customise your DINO pedal go kart with an additional passenger seat. Add one of these DINO passenger seats and carry one of your friends around with you so that you can both enjoy the fun given from using one of these fantastic DINO go karts. These sturdy built trailers are made in Germany and will add to the many hours of fun the children will enjoy. There are no products available in this section at the moment. Follow us on social media to be kept up to date with the latest news, and be the first to hear about our special offers.